Folkestone Festivals in association with the Ska Co-op present FOLKESTONE SKA FEST 2014. The Festival which is renowned locally, nationally and internationally will take place on 8th, 9th and 10th of August 2014. This years event (The 5th year of the festival from its original roots as the Folkestone Skabour Festival) will be principally based at Folkestone’s well known concert venue The Leas Cliff Hall, plus second stage at The Channel Suite function rooms, this part of the festival will operate as ticketed events. There are 27 bands and 30 or more DJs. The headliners are the Jamaican Boss Reggae/Ska legends THE PIONEERS. Skinhead reggae legend ROY “MR SYMARIP” ELLIS. Plus WINSTON FRANCIS, JUDGE DREAD MEMORIAL BAND from Holland, THE UPSESSIONS, KING HAMMOND & SKAVILLE UK. The SKAMANIANS return from France and so to THE EASY SNAPPERS from Germany. Local band favourites TOOTNSKAMEN, SKATONICS and HEY RUDI with Kent fan following and many more. The festival expands into the immediate surrounding areas with a FREE community areas Includings a Ska Fest Market & Ska Fest Island on the Leas Cliff Hall roof top. In addition the Leas grass areas will see a classic Scooter Park, organised by the local scooter clubs Folkestone ‘69 Sloths’ & South Coast Pirates which features a scooter ‘ride out’ and show awards for Best Lambretta, Best Vespa and various other competition awards. The Leas Ska Fest Island with more stalls and children’s rides. The atmosphere will be Jamaican/Caribbean with a steel drum band and palm trees made by the charity we are supporting this year being Folkestone ARRCC. As with previous years FOLKESTONE SKA FEST will also embrace the community festival atmosphere through out the town and harbour that supports the Ska Festival. 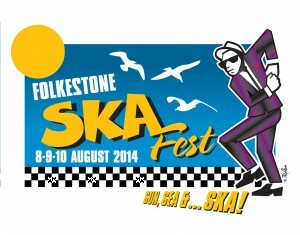 Folkestone Ska Fest, Folkestone Festivals and Ska Co-op are not-for-profit organisations run entirely by volunteers. You are currently browsing the classic 2-tone graphics news archives for June, 2014.